How do I check if my Salesforce integration is working correctly? How do I embed a Vidyard player into a Salesforce knowledge article? How do I add a Vidyard Video Hub as a Salesforce tab? Log into the Vidyard dashboard. 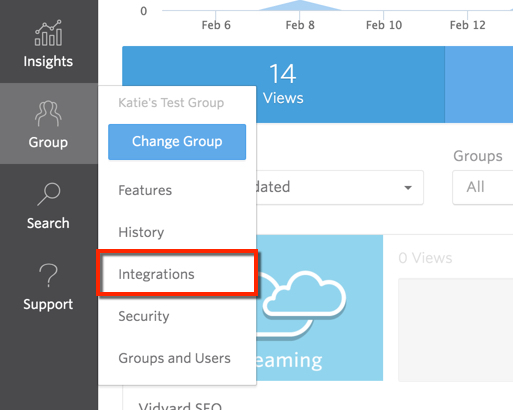 From the Group menu, click Integrations. In the Salesforce section, click Remove Salesforce Link. Click Connect a Salesforce Account. You will be prompted by Salesforce to allow the permissions requested by Vidyard. Click Allow. Once the accounts are connected, a notification will be displayed and your OrgID will be displayed. Note: When performing these steps to resync your Salesforce and Vidyard accounts, it is not necessary to do anything with the app in Salesforce. Once the accounts are reconnected, the app will resume functioning. In order to minimize the chances of this occurring, it is suggested that you prevent refresh tokens from being revoked for the Vidyard app. In Salesforce, go to Setup. Under Manage Apps, click Connected Apps. Find Vidyard in the list and click Edit. Under OAuth Policies, look at the Refresh Token Policy to ensure it is set to "Refresh token is valid until revoked"
If Salesforce is already configured to keep refresh tokens until they are revoked, it is advised to contact Salesforce support to determine how the refresh tokens are being revoked in your Salesforce instance.